If you enjoy spreading lashings of orange marmalade on your toast you should know that the first marmalades were not made with oranges, either bitter or sweet. The word marmalade actually comes from the Portuguese word for quince which is marmelo. Quince fruit is from the genus Cydonia in the family Rosaceae (which also contains apples and pears, among other fruits) and is very similar looking to a pear. I will advise you that even though this fruit is related to apples and pears and tastes a little like both of those fruits, it does have its very own unique flavor. Furthermore, I don't recommend eating quince raw as it is very fibrous, kind of tasteless but bitter and a bit dry. The best way to eat quince is in the form of a cooked paste or conserve. Though the quince fruit is native to southwest Asia, Turkey and Iran, it made its way to England from Portugal or Spain. By the sixteenth century, it could be found in British gardens and recipes. 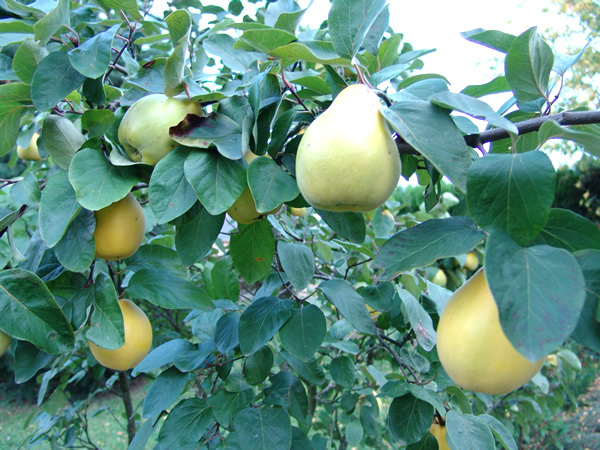 Early British recipes for quince are for pastes such as marmalades and firmer types of marmalade known as membrillo or quince cheese. 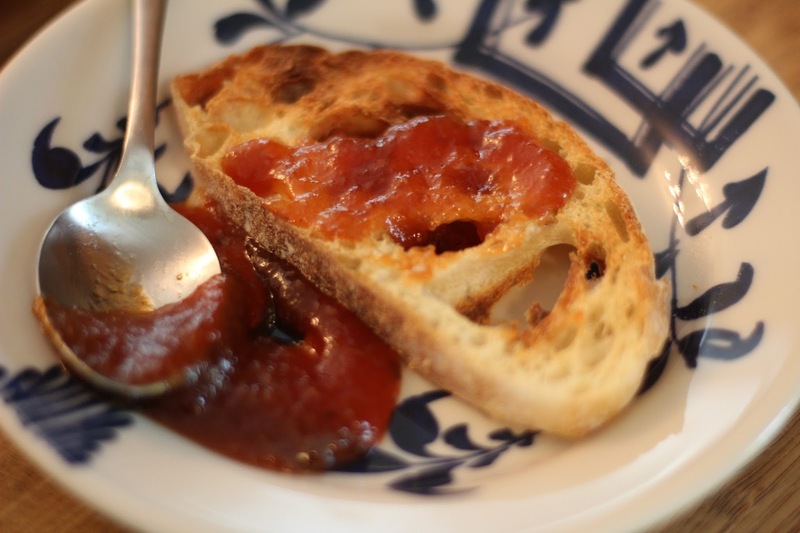 In my experience, quince makes the best tasting version of marmalade I have ever had. It has a much milder and more fruity taste than its later descendant made with the bitter orange. It also cooks up into a beautiful red color. If Quince are Colorless, Why is the Cooked Paste Red? The answer to this question lies in the fact that quince contain lots of anthocyanins which are bound up in the natural tannins also found in the fruit. It is these tannins that make the fruit less than desirable to eat raw. However, when quince are treated with heat and/or acid, the tannins are broken down and the anthocyanin red pigment is released. 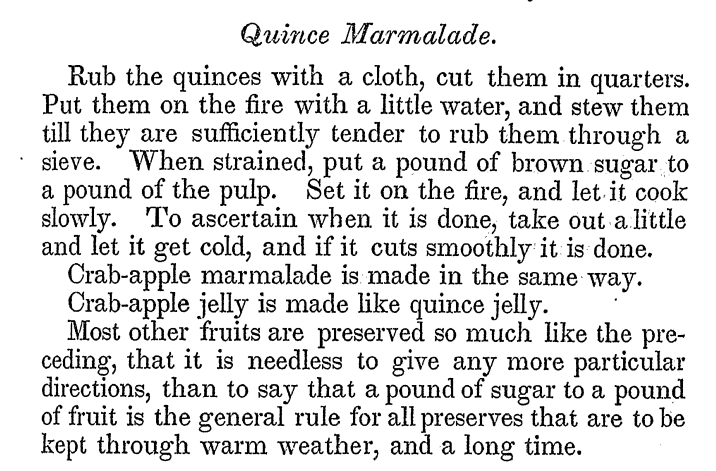 Here are some early quince references and recipes to sink your teeth into . . .1. A very early reference to "molded marmalade" comes from a December, 1557 banquet (formal dessert/sweet service) held in Liege. Here is the English translation by Debby Banham & Laura Mason, Petits Propos Culinaires 69, Prospect Books, Devon, UK, 2002. Take quinces and divide in 4 pieces with a knife and take the flesh separated from the pips and boil it in a pan with clear water until it is soft, then remove from the fire and strain through the middle of a strainer or sieve, in English sieve, and if there are eight pounds of flesh add 6 pounds clarified honey and put in over the fire and let it boil, stirring continuously with a ‘sword’ until it is completely cooked, and test this in this way: take a knife, and take some of the mixture on the point of the knife and let it cool and what cools, if the mixture is in itself somewhat strong, in English stiff, then it is cooked enough: then remove from the fire and stir well until it begins to turn white, then add two pounds of eringo powder, 3 ounces of ginger, very finely [chopped?] and 6 ounces of ginger powder, and put all these, combined, into boxes and keep until needed, and in this way you can make Chardewarden, Chardecrab, Chardedate, but the dates shall be ground in a mortar and not cooked, and the honey shall be cooked until it sticks hard between the fingers, and then put in the dates, and if you want to prepare it with sugar, put to one pound of pulp 2 pounds of clarified sugar, 2 ounces of spices, as stated above, except that you do not put in eringo powder. 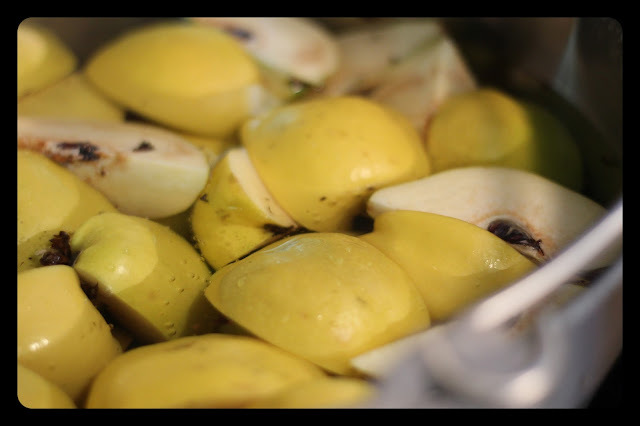 Cover the quinces with water, simmer until tender, drain, and rub through a sieve. Boil the pulp and honey together until a small sample sets like thick jam, then remove from the heat, stir in the ginger and pack into a shallow box from which it may be cut as required. Red marmelett. Take quinces and pare them, quarter them and core them. Then take a pound of them and a pound of sugar and half a pint of water, and put all in a skillet; and when it is hot take a good many of the cores of the quinces and toe them up in a piece of lawn and put them in. Then cover them and let them boil softly for two hours. Then take out the cores and wring them between two trenchers; and then break the quinces, and cover them, and let them boil apace, and stir them till they may be enough. And so put it into boxes. 1. Place the cut-up quince fruit, cores, peels, pips and all into a thick-bottomed saucepan and cover with water. Bring to a boil and then reduce heat to medium and simmer for 40-45 minutes. Stir periodically to prevent sticking and to heat the fruit evenly. 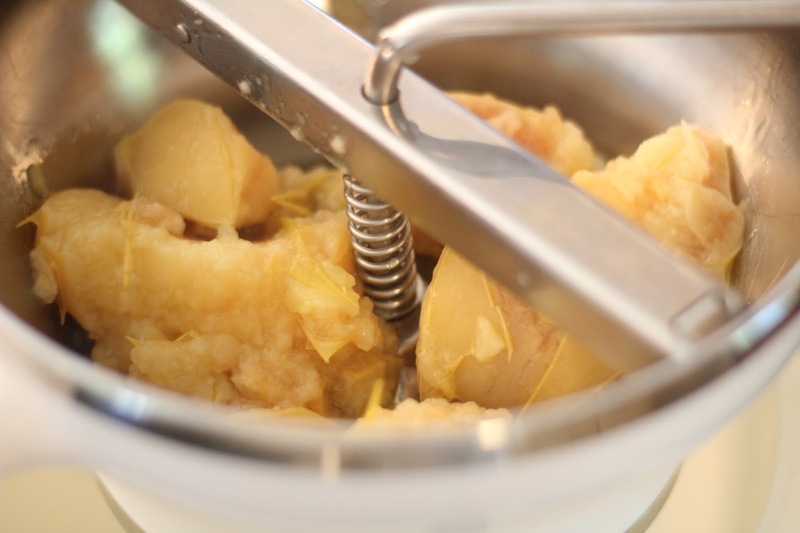 Cook until the peels start to crack and the flesh of the fruit is soft enough to put through a food mill. 2. Remove the cooked fruit from the heat and allow it to rest for a few minutes until it is cool enough to drain. Drain the fruit and then work it through the food mill to release the pulp from the cores, pip and skin. 3. Using the kitchen scale, weigh the pulp and then place it back in the cooking pot. 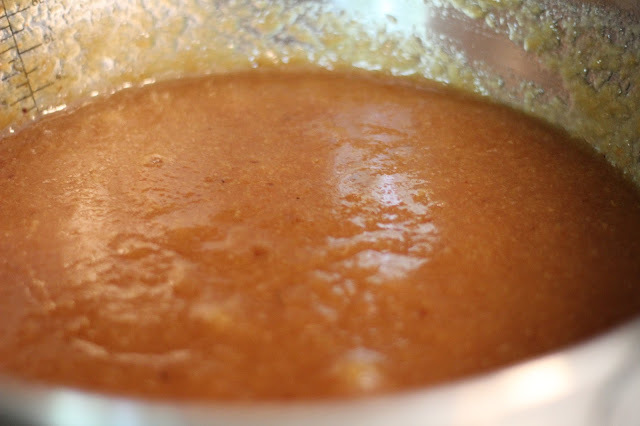 Add an equal weight of sugar, stir until all of the sugar and quince pulp is completely mixed. Bring the mixture to a boil and immediately remove from the heat, stir, and lower the temperature to medium low. Return to the now lower heat and cook this mixture for 60 minutes, stirring frequently. See how the quince turns red with the addition of heat and sugar! 4. To test if it is ready, place a small on a plate to see if it sets-up like jam. If you want a firmer consistency (also called membrillo or quince cheese), let it cook down for about another 30 minutes. 5. Let cool a bit and then pour into boxes for immediate use and/or seal with the hot water bath canning method. To Serve: This is great with cheese, spread on toast or coated on pound cake! Andrew Dalby and Maureen Dalby, The Shakespeare Cookbook, The British Museum Press, 2012.